AutoTrac Turn Automation is designed to allow operators to focus on machine and job performance while reducing operator fatigue. John Deere has announced its latest advanced guidance and machine data sharing technology with the addition of three new AutoTrac™ applications, as well as an In-Field Data Sharing application. These features will be available to customers utilizing Generation 4 displays. 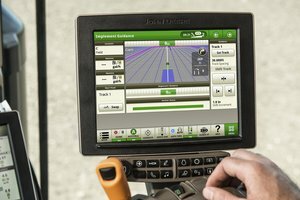 AutoTrac Turn Automation, AutoTrac Implement Guidance, AutoTrac Vision for Tractors, and In-Field Data Sharing applications are being bundled for the John Deere 4600 CommandCenter. There will also be bundled subscriptions for 4640 Universal Displays. “These new applications are machine-specific bundled activations with the 4600 CommandCenter and provide late-model John Deere machine owners with outstanding technology value,” said John Misher, precision agriculture product marketing manager with John Deere. AutoTrac Turn Automation makes end turns smoother and more comfortable for operators during tillage. AutoTrac Implement Guidance allows the tractor to move off its intended path to achieve the expected accuracy of the implement. With AutoTrac Vision Guidance, the crop row can be easily detected to provide input to the machine’s AutoTrac system. This keeps the tractor’s wheels or tracks between crop rows as necessary. In-Field Data Sharing allows operators to coordinate multiple machines that are working across the same field. “It’s easy to share and check maps with In-Field Data Sharing. Operators can monitor machines’ as-applied maps to see if they’re properly calibrated and performing in a similar manner, thus maximizing machine performance,” Mishler adds.